If the circuit breaker in your home trips, restart it by flipping the tripped switch to the off position and then back to on. If your breaker trips again, call an electrician to come and service the breaker. One of the most common reasons for a tripped breaker is loose electrical connections. Aluminum wires tend to expand and contract, thereby loosening over time. Another common cause for your breaker to trip is a direct electrical short in the wiring or equipment. You can tell if this is the problem if the breaker trips instantly once the unit tries to start. If this happens, call an electrician to service it immediately. There are times when a breaker trips due to the compressor having trouble starting. The compressor might be old, weak or just tight. While you can buy a Hard Start Kit, the problem may be easily fixed by replacing a bad capacitor, which helps start the compressor. 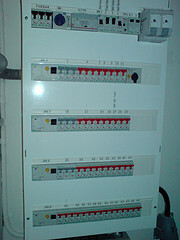 The reason your breaker trips in the first place is to protect your equipment, wiring and home. Do not ignore the situation, as it could result in high voltage and amperage, leading to melted wires and even possibly a fire. Remember a circuit breaker should not feel hot to the touch. Utilize the backs of your fingers to check the temperature of the breaker; if it is room temperature or warm, then it is safe; but if it is hot, that could be a sign of a problem. Contact a professional electrician. Is Your Dryer Running Efficiently?